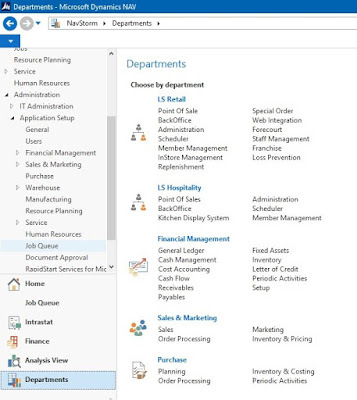 Read the full setup of NAS : How to setup NAS (Navision Application Server) for Microsoft Dynamics Nav 2013 R2? 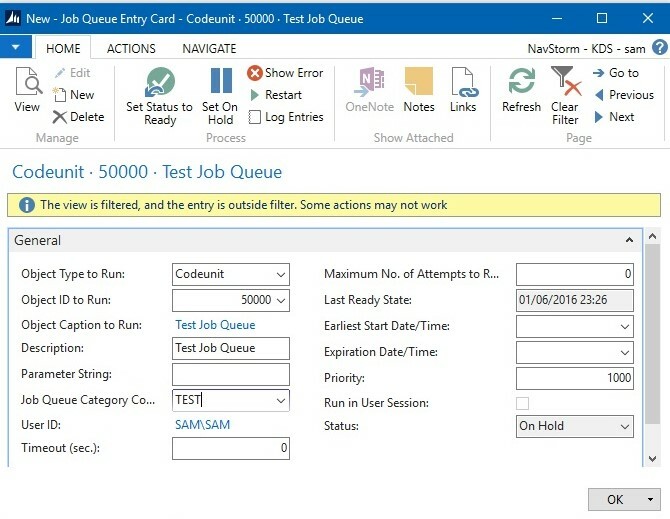 Where can I find Job Queue in RTC? Job Queue run in Categories. Open the Job Queue Category List and Create a new Category as TEST. Open the Job Queue Entries. 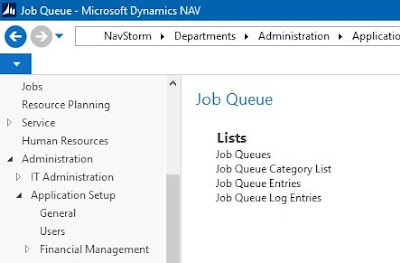 Click on New to create a New Job Queue Entry. In this article we are setting up a Codeunit 50000 to Test Job Queue functionality, so we mention Codeunit in Object Type and enter 50000 in the Object ID. Mention the Category Filter as 'TEST'. Complete the form with required details and then Click OK.
Click on Set Status to Ready in the top menu bar. Now you will see that the Status of the Job Entry will change from 'On Hold' to 'Ready'. 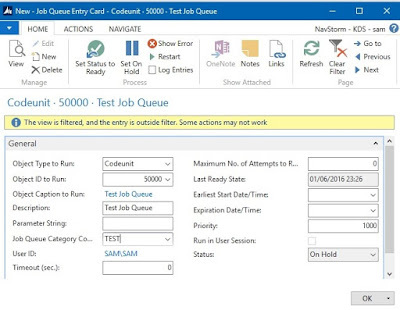 Note : The Job Entry which is created will not run even if its is in ready state as there is no Job Queue started or having Job Queue Category Filter as 'TEST'. Click on New to Create a New Entry in the Job Queue. 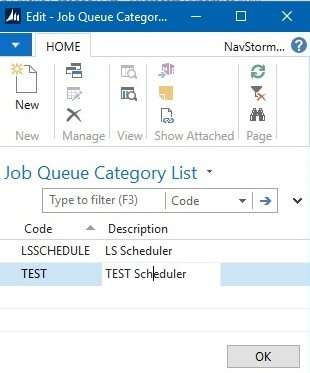 Enter the Name and Description of the Job Queue and put the Job Queue Category Filter as 'TEST' and then click OK.
Click on the Job Queue and then Click on Start Job Queue. 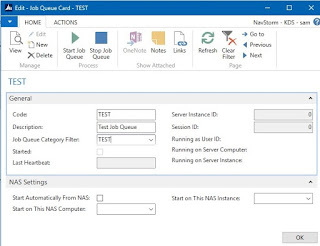 While running the Job Queue manually make sure that in the NAS Setting of the Job Queue, the Start Automatically From NAS is unchecked otherwise the Job Queue will not start manually. Open the specific Job Queue you want to schedule using NAS. 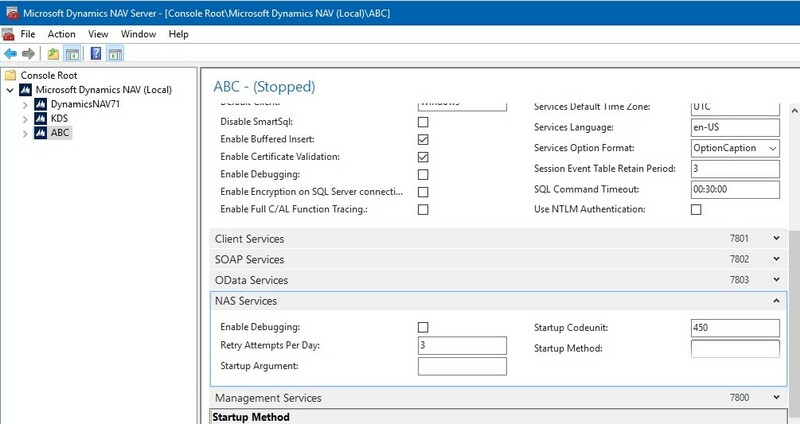 Check the boolean Start Automatically From NAS. 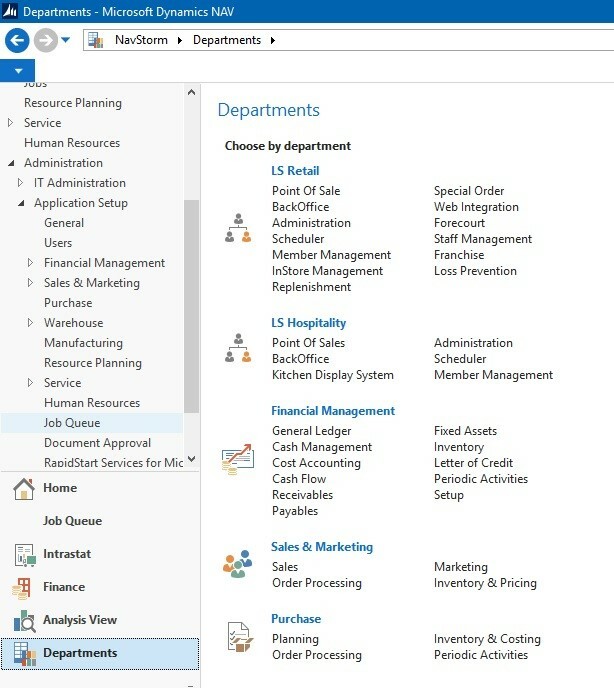 Go to the Microsoft Dynamics NAV 2013 R2 Administration. 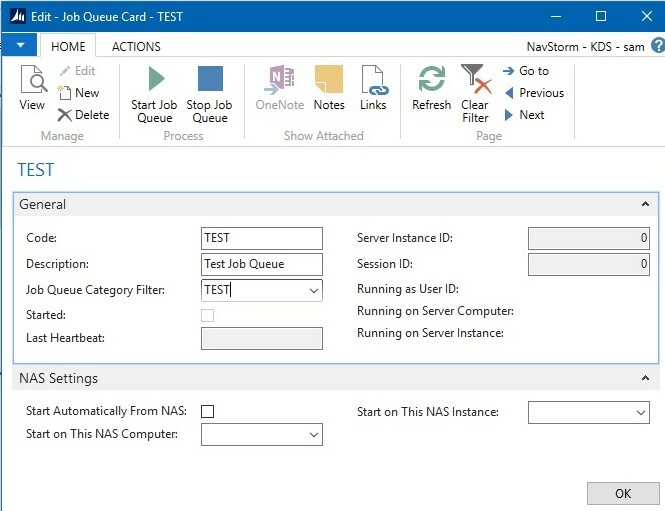 Create a service specially for NAS scheduling of Job Queue. 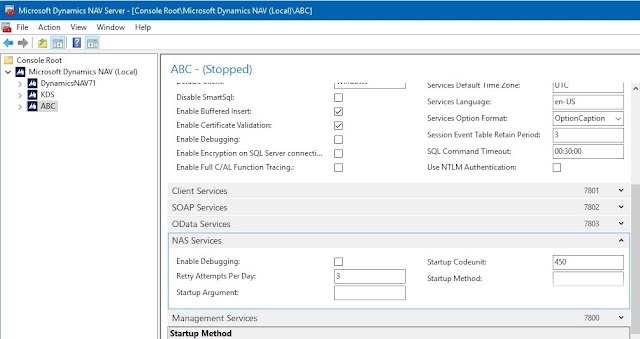 In the NAS Services tab, fill the Startup Codeunit as 450 which the Codeunit for Job Queue. Thanks for reading the whole article. I hope you find the article useful. Please drop your comments below if you are having any problem in the process. To get more clarity regarding Job Queue Setup in Microsoft Dynamics NAV 2013 R2, watch the video below and Subscribe to our Youtube Channel. How do i set up multiple job queue at a same time. now i want to execute all 3 jobs at a same time. but its started any one, once one is completed then 2nd one is started and so on. could you tell me how can i start all at a same time. i created 2 services but still its run one by one. 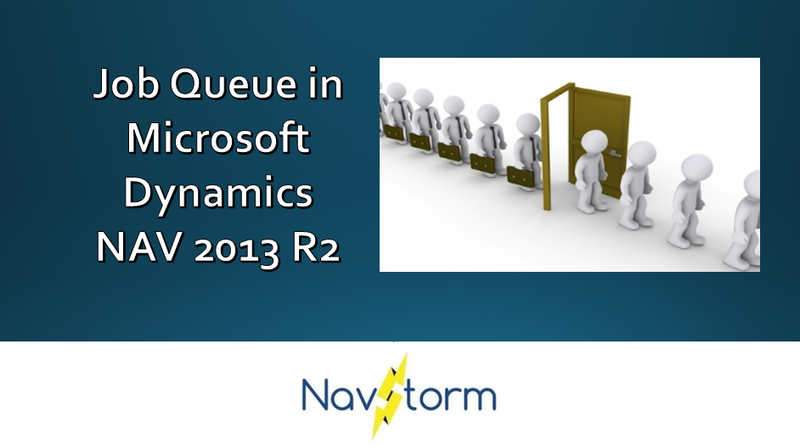 The meaning of the Job Queues is as simple as the name suggests that the Job is Queued to run the objects one by one. It cannot start all at the same time. It is scheduled to run the objects one by one.